Close your eyes. Picture yourself standing in a garden and hearing the nearby waves crashing onto the shore. Sounds like a dream? Not this weekend. That description is one of the many private gardens open for participants of the Newport, Rhode Island Secret Garden Tour, beginning today. While both the spring and fall versions of the tour are self-guided, the fall tour encourages participants to stroll up Bellevue Avenue, where most of the mansions are located. After purchasing a ticket, participants are given a program with a map and directions to each of the open gardens. All gardens featured this weekend reflect different design styles. “There are swimming pools in some. Some are heavily decorated,” said Maytum. “Six are very large and professionally maintained,” she said. “In the fall, most people travel by car to each garden, even though there are four to five that you can walk to. It’s great on a bicycle.” Parking is available at the designated properties or on the street. While attendance at the tour is weather dependent, the weather forecast for this weekend looks favorable, with sunshine and temperatures hovering near 70 degrees Fahrenheit throughout the weekend. “It’s supposed to be a beautiful weekend,” she said. The Secret Garden Tours began in 1984 by Myra DuVally to raise funds for arts education in Aquidneck Island public schools. When DuVally passed away, Maytum kept the tradition going. “She was a single lady totally dedicated to the arts and public education,” said Maytum. “I’ve been involved with it from the beginning, and as she became ill, I began doing more myself. After she passed, I became dedicated to keeping it going.” In a good year, the tours raise between $20,000-25,000 for the schools. The spring version of the tour focuses on more gardens that are maintained by homeowners and are usually smaller in size. 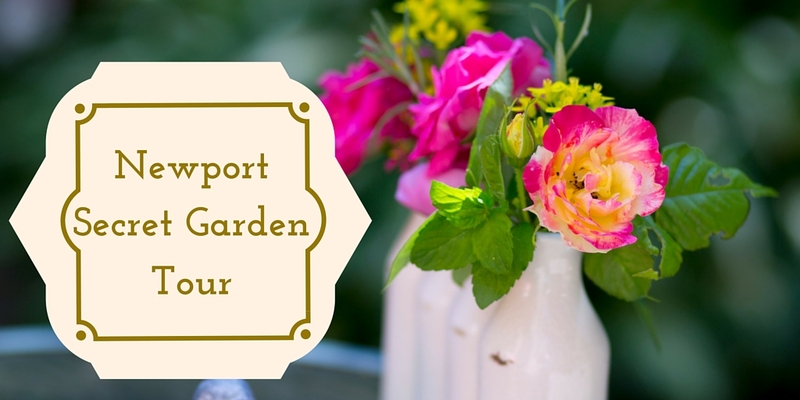 To read more about the 2016 spring Secret Garden Tour, click here. Tickets can be purchased at Kingscote Mansion at 253 Bellevue Avenue, Newport, R.I. for $25 (cash and personal check only). All the proceeds go to funding arts education in public schools on Aquidneck Island.